Daniel Colman rose to fame in 2014, with his victory in the $1,000,000 buy-in Big One for One Drop event at the WSOP. He won 15.3 million dollars, the second largest first-place prize in poker history. 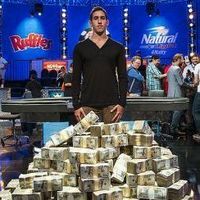 Following his success, he declined all interviews and later explained his reasons in a post in the Two Plus Two poker forum. The main problems he noted were the undue promotion of gambling and the distorted image of poker presented by the media. He is known to play online under the "mrGR33N13" and "riyyc22" nicknames. If you are Daniel Colman click here to take control of your profile. Congrats on your 3rd place, Daniel Colman! Your result in the 2015 SHR Poker Open $5250 NLHE USD5 Million GTD event on Aug 15, 2015 at Seminole Hard Rock Hotel and Casino - Hollywood increased your total earnings by $310,000! Congrats on your 3rd place, Daniel Colman! Your result in the 46th Annual World Series of Poker 2015 Event 58: $111111 NLHE High Roller for ONE DROP event on Jun 28, 2015 at Rio increased your total earnings by $1,544,121! Congratulations to Daniel Colman for finishing 7th and earning 2,900,000HKD in the $64512 NLHE HKD$500 000 tournament! Congratulations to Daniel Colman for finishing 1st and earning $964,539 in the $102315 NLHE tournament! Congratulations to Daniel Colman for finishing 1st and earning £600,000 in the £60000 NLHE WPT Alpha8 - London tournament! wow allmost pretty close to a triple crown he hasnt stoped winning since Big One For One Drop Holy ****! Great Job. there goes to show you that Internet players (Like Myself lol) are not ALL Fishers and Play for only suckout cards. Congratulations to Daniel Colman for finishing 1st and earning $1,446,710 in the Seminole Hard Rock Poker Open Championship ($10,000,000 Guaranteed) tournament! @sylverphenix ce que tu dis est intéressant. "Tu dois". En fait non, il n'a pas d'obligations. Il est libre d'exprimer ou pas ses sentiments, quels qu'il soit. Après, que son attitude soit une déception et que ça ne corresponde pas aux attentes du public c'est une chose... que ce ne soit pas l'ambassadeur idéal pour le poker est aussi un fait... mais perso je pense que ça fait aussi du bien d'avoir des personnages différents, avec du relief et des personalités fortes qui sont encore capables de nous surprendre ;). Congratulations to Daniel Colman for finishing 2nd and earning 843,066€ in the Event #10 - No Limit Hold'em Super High Roller tournament! Congratulations to Daniel Colman for finishing 3rd and earning $796,821 in the Super High Roller tournament! Congratulations to Daniel Colman for finishing 1st and earning $15,306,668 in the Event #57 - WSOP No Limit Hold'em The Big One for One Drop tournament! VGG for winning this fight between DanielS ;).